Learn about healthy eating, serving sizes and the Canada’s Food Guide through interactive education activities. Also in the kit is the Alberta Nutrition Guidelines Portion Size Kit that explains proper portion sizes with items that are easily recognizable by children. 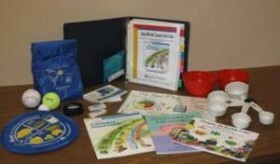 Each item represents one Canada’s Food Guide Serving of certain kinds of foods. This handout compares portion sizes to common objects like a baseball, tennis ball or golf ball. It includes information about the difference between a serving and a portion and describes what a healthy plate should contain.